Bryan P. Franey, Esq. and Shelby L. Hancock, Esq. The forecast for the Renewable Fuel Standards (“RFS”) program in 2019 is litigation, litigation, and more litigation. The RFS program is codified at Section 211(o) of the Clean Air Act (Act) and establishes minimum volume requirements for four separate categories of renewable fuels: (1) total renewable fuels; (2) advanced biofuels; (3) biomass-based diesel; and (4) cellulosic biofuels. The volume requirements for total renewable fuels, advanced biofuels, and cellulosic biofuels increase each year through 2022, whereas and the volume requirements for biomass based diesel increased each year through 2012. After these years, EPA is responsible for establishing the annual volume requirement through rulemaking. To ensure that the annual volume requirements are met, EPA is required, by November 30 of each year, to publish annual percentage standards that will be in effect for the following compliance year. The annual percentage standards are used by refiners and importers of transportation fuel to determine their individual renewable volume obligation. Obligated parties comply with the RFS program by submitting tradable credits referred to as “renewable identification numbers” or “RINs” to EPA each year based on the individual renewable volume obligation. Almost since its inception, the RFS program has been challenged by a variety of parties through litigation, EPA’s rulemaking process, and the political system. For example, the petroleum industry frequently challenges the program based on its cost, disproportionate impact on certain refiners, EPA’s timeliness in promulgating rules or responding to requests, and the program’s overall complexity. The biofuel industry (typically corn-based ethanol producers) has tended to take the opposite view of the petroleum industry and have argued for increasing the annual RFS standards and objected to EPA’s use of waivers and exemptions. The environmental advocacy community has challenged whether the RFS program has delivered on the promised environmental benefits (e.g., greenhouse gas emissions reductions). EPA has struggled to keep up with the significant demands of the RFS program which has given rise to substantial delays in approving fuel pathways (i.e., evaluating fuels that qualify under the RFS program) and issuing the annual RFS standards. Based on the significant challenges encountered in its 14-year history, the RFS program would appear to be ripe for a legislative fix. Several bills have been introduced over the last two years to reform the RFS program, but none of the bills came close to passage. With control of Congress now split between Democrats and Republicans, the prospect for legislative reform of the program appears dim. Petroleum refiners and an industry group for biomass-based diesel each challenge EPA’s renewable fuel standards for 2017 and biomass-based diesel volume for 2018. See Coffeyville Resources Refining & Marketing LLC et al. v. EPA, 17-1044 (D.C. Cir.). The refiners contend that EPA set the annual volumes for advanced biofuels and total renewable fuels too high and that EPA failed to account for market realities or properly use its waiver authority. The refiners also contend that EPA, as part of its annual rulemaking, must reconsider which parties are obligated to comply with the renewable fuel standards. In 2007 and in 2010, EPA designated refiners and importers as “obligated parties,” but did not designate downstream blenders. The refiners argue that the prior regulation places a disproportionate burden on refiners, specifically independent refiners, for meeting renewable fuel blending obligations. From the other side, the National Biodiesel Board (NBB), a group representing members of the biomass-based diesel industry, contends that EPA set the standard for biomass-based diesel volume too low. NBB argues that EPA should have analyzed biomass-based diesel in isolation, instead of considering it within the larger context of advanced biofuel volumes. EPA responded to the separate challenges by arguing that it correctly analyzed and set volumes for biomass-based diesel, advanced biofuel, and total renewable fuels; reasonably exercised its waiver authority; and was not required to reconsider obligated parties in its annual rulemaking. A panel of the D.C. Circuit heard oral argument on October 5, 2018, suggesting an opinion could come in 2019. While Coffeyville was pending, EPA issued its renewable fuel standards for 2018 and biomass-based diesel volume for 2019. A petroleum refining industry group, NBB, and several environmental groups (among other parties), challenged EPA’s rulemaking. See American Fuel & Petrochemical Manufacturers v. EPA, 17-1258 (D.C. Cir.) In addition to the contentions raised in Coffeyville, the petroleum refiners also contend that EPA erred when it refused to waive volume requirements for refiners and states that could suffer severe economic harm if forced to comply with the renewable fuel standards. On the other side, NBB contends that the EPA set the standards for advanced biofuels and biomass-based diesel volumes too low. NBB also contends that EPA failed to account for small refinery hardship exemptions when setting percentages that ensure aggregate volumes are met. Environmental groups, like Sierra Club, have also challenged the rule, contending that the renewable fuel standards violate the Endangered Species Act because EPA failed to consult with wildlife agencies about the impact of its program on endangered species and the environment. Once again, EPA responds that it reasonably calculated appropriate volumes for cellulosic biofuel, biomass-based diesel, advanced biofuel, and total renewable fuel; reasonably declined to review its “obligated parties” regulation; and reasonably concluded that there was no credible evidence of severe economic harm to states or small refineries. As for the environmental groups, EPA argues that their challenge is procedurally improper and fails on the merits because EPA determined that the rule does not affect listed species or critical habitat, and for that reason, was not required to consult with wildlife agencies. Oral argument is scheduled for February 20, 2019 before a panel of the D.C. Circuit. It is unclear whether that argument will be affected by the federal government shutdown that began on December 22, 2018. On November 30, 2018, EPA released its renewable fuel standards for 2019 and biomass-based diesel volume for 2020. The rule was published in the Federal Register on December 11, 2018, and will go into effect February 11, 2019. As of January 8, 2019, no parties had challenged the final rule, but interested parties have sixty days from the date of publication in the Federal Register to file an action with the D.C. Circuit. Given the consistent challenges to EPA’s annual renewable fuel standards in the past, we expect EPA’s most recent standards will also be challenged. EPA has the statutory authority to apply the annual volume obligation on “refineries, blenders, and importers, as appropriate.” In 2007 and in 2010, EPA decided that it was “appropriate” to apply the annual volume obligation on refiners and importers, but not on downstream blenders. No party sought judicial review of EPA’s determination on the so-called “point of obligation” in 2010. However, beginning in 2016, several petroleum refiners and petroleum industry groups sought to challenge EPA’s decision to exclude blenders as obligated parties. The various petitions and judicial challenges have been consolidated before the D.C. Circuit in See Alon Refining Krotz Springs v. EPA, 16-1052. In Alon Refining, the petroleum refining industry contends that the misalignment of the point of obligation has frustrated the purpose of the RFS program, harmed refineries that have no access to blending facilities (i.e., independent refineries), and produced windfall profits for unobligated blenders. EPA argues that the challenge to its 2010 decision on the point of obligation is not timely and that the petitioners failed to identify grounds for appeal that arose after the appeal period expired. Even if the petitioner’s appeal is timely, EPA argues that its decision to deny the various administrative petitions is well-supported by the record and that changing the point of obligation would not result in net benefits to the RFS program. A panel of the D.C. Circuit heard oral argument on October 5, 2018, and an opinion could come in 2019. If the petitioners are successful in their challenge to the point of obligation, then such a result could fundamentally alter the RFS program. Adding blenders as obligated parties would likely require EPA to revise its regulations and thousands of blenders could be newly subjected to compliance obligations under the RFS program. On October 11, 2018, the Trump Administration issued a briefing statement directing EPA to initiate rulemaking to consider the expansion of Reid Vapor Pressure waivers for fuel blends containing up to 15 percent ethanol (E15). The waiver would allow for the year-round sale of E15, which is currently limited to an eight-month period. The briefing statement also directed EPA to consider, within the same rulemaking, modifications to the RFS program designed to increase transparency and prevent manipulation of the RIN market. 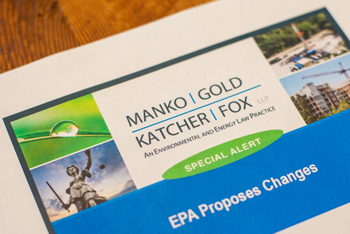 According to Office of Management and Budget, EPA intends to issue a proposed rule in February 2019. It is unclear whether the federal government shutdown will affect the timing of this rulemaking effort. And based on the history of the RFS program, any final rule on E15 is likely to be subject to a judicial challenge.